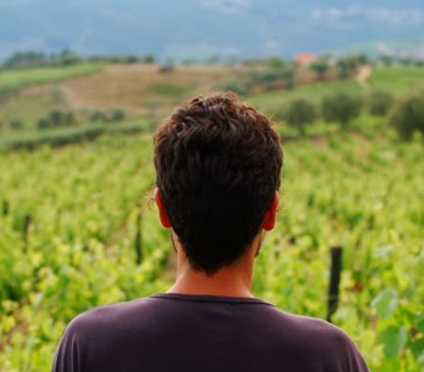 Tiago Sampaio is the innovative young winemaker of Folias de Baco, a project started in 2007 that one could say was spearheaded in his childhood piggybacking on his grandfather through the farms and vineyards, always curious and plucky, willing to experiment at every step of the way. It was this incurable fascination that led him into agricultural studies at Santo Tirso and then five years of university in Vila Real, but it wasn’t until completing an agricultural engineering course that opened the doorway for his PhD studies in Oregon for Viticulture and Enology. It was here that Tiago picked up on modern philosophies and aesthetics of winemaking, while never forgetting his roots in the Douro and returning to create his estate that has garnered much attention since. 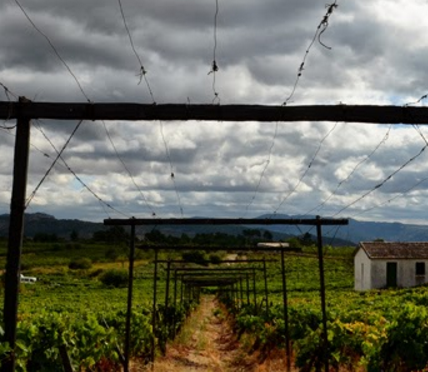 Specifically located in the Alto Douro, in the sub-region of Cima-Corgo – where the land is rough, tough and challenging – you will find his vines clinging to the slopes of schist and granite at an altitude between 500-700m. Tiago is essentially bridging the traditions of his homeland with learned modern aesthetics, creating field blends of both red, white and mixed from indigenous varietals planted some 80 years ago, while carefully attending to his new fixation of Pinot Noir vines that he makes both red and rosé. Tiago has set his sights higher, pushing the boundaries of his curiosity and what some might not expect out of such a traditional region. From 16 year old vines planted on 2ha of schist and granite soils. The grapes are hand-harvested in mid-August, undergo vineyard sorting, are pressed whole cluster with no time on skins with fermentation lasting three weeks with wild yeasts. No dosage. Not fined or filtered. From 10-35 year old vines planted on 2ha of schist and granite soils. The grapes are hand-harvested in the beginning of September, undergo vineyard sorting, are pressed whole cluster with no time on skins with fermentation lasting four weeks with wild yeasts. No dosage. Not fined or filtered. From the Douro Appellation, these vines are over 35 years old with a soil composed of a schist and granite blend. These grapes are hand harvested in september and aged in stainless steel for four months. Fermentation period lasts for three weeks. This is a field blend of Viosinho, Rabigato and Gouveio. The vines are over 80 years old and hand harvested in early September and early October. Vinification involves a cold maceration of 24 hours followed by gentle pressing. Fermentation is done in French Oak. legume blend to fertilize the soil in nitrogen. Vinho Tinto, "Uivo Vinhas Velhas Reserva"
From up to 20+ traditional Portuguese varieties from 80 year old vines planted on 4 hectares of schist and granite soils, the grapes yield is naturally low (1kg/vine max), the grapes were hand-harvested between September and October, undergo vineyard sorting and partial de-stemming before maceration that lasts between 5 days to 3 months. Fermentation takes place in granite lagar (1000L) with wild yeasts that lasts about three weeks. Aged in French oak (225L), around 2 years old, for two years. Not fined or filtered. Douro Reserva Tinta Francisca, "Uivo"
Duriense Reserva Pinot Noir, "Uivo"
From 14 year old vines planed on 1ha of schist and granite soils. The grapes are hand-harvested in early September, undergo vigorous vineyard sorting, partially de-stemmed (50%) and then spends one month macerating. Fermentation takes place in 1000L granite lagar and lasts three weeks under temperature control. Aged in 225L French oak (2 years old) for 3 years. Not fined or filtered.